In Harry Potter And The Sorcerer’s Stone, Lord Voldemort killed Harry’s parents. He has to live with his Aunt, Uncle, and his cousin. They make him sleep in a cupboard below the stairs. Then letters started appearing in the house. One day a man named Hagrid from Hogwarts broke down the door on Harry’s birthday and brought a cake for him. Hagrid grabbed Harry and rode him on his bike to the train to Hogwarts. When he was on the train he met two friends named Hermoine and Ron. When they got to Hogwarts they got sorted into houses. The hat said Slytherin, but Harry begged the sorting hat to make him go to Gryffindor. Then Professor McGonagall tells Wood to train Harry for Quidditch and show him what all the balls and positions of Quidditch. I like this book because I like wizard books and books that have action in it. I would recommend this book to people that like action in their books. 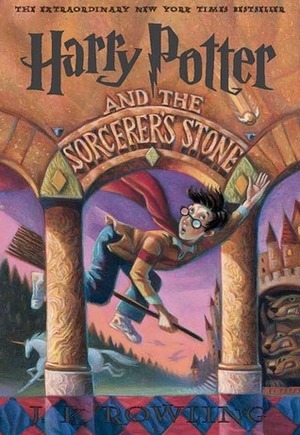 If any of you love or like magic, dragons, sarcasm, heros with robes, and Quidditch, welcome to Harry Potter Year One. Learn about his adventure he has at Hogwarts and see who he meets. better then the movie. I wasn't sure if I was going to write a review of these books, but I try to write a review of all of the books that I read, and it's been kind of nagging at me that I didn't write one for this. It's hard to write a review for a book that is so dang popular and well known. What is there to say that's new? I dunno. I think pretty much everything's been said, but still I wanted to write a review for this, and to talk about these books, even if I'm just rehashing everything that's already been done. I remember when these first came out, I never really wanted to read them. I thought of them as "kid's books" and even though I read YA, my overly-critical half just kept saying that these weren't for me. I don't know if it was the cover, or the insta-popularity of the books or what, but I didn't read them. I avoided them like the plague. Until a friend of mine was reading the 5th book, and was so engrossed in it that he would do the "...yes, yes, I'm paying attention..." nod while his eyes remained glued to the page. And as a reader myself, I know that look. So I asked to borrow the book he was reading, and he refused. He told me that if I was going to read it, I'd have to READ it, starting with the first book. So the next day, he lent me the first and second books, both of which I finished in record time, and then I understood. And I never looked back. There's something about these books that is just... magical. Yeah, yeah, cliche, I know. But it's true. Yes, they are about magic, but they are about so much more than that. They are about love, and friendship and loyalty and trust and betrayal and commitment and all the things that we aspire to have and to be as humans. They are about understanding and forgiveness and learning who we are when it really matters. And all of these things are buried in this shell of fun and adventure and mystery that makes them irresistible. I decided to read these again in the original UK editions, because I know that the US editions were "Americanized", and I wanted to re-experience them in their true form. I dislike when things are changed from their original format, I hate abridgments and condensed versions etc. I want to experience the story how the author wrote it, how it was meant to be experienced without some guy in a suit somewhere trying to make it "accessible" to me. I like the feeling that I get of learning something of another culture through the words they use, and the meaning that they give the words. This is why they taught us reading comprehension in third grade, so that we can read and LEARN. Learning doesn't have to be boring and tedious, it can be fun if we allow it to be. But it seems that we've lost that ability. Sad. Anyway, I re-read the first book, now appropriately titled "Harry Potter and the Philosopher's Stone", and I was surprised at how emotional I felt reading it, especially after knowing where it all ends. It was like seeing friends that you've missed for years again, and while it makes you happy to see them, it's also sad because you know they'll have to go again too soon. That's how I felt, like I was seeing friends and that my time with them is short. That's kind of a silly way to feel, because they are forever, and I can visit anytime I want to, but I felt that way anyway. Especially meeting Ron again. He's my favorite character for an absolute reason, which is because he is so loyal and funny and true, and he gives his whole heart when he gives it at all. I wish that there were more people like Ron. I can't wait to re-read the rest of the series and see if this feeling remains. I love discovering the hidden gems that Rowling has left for us to find, in mythology and history and legend and word-play and in life. Who wouldn't love these books?